Ryan Harley wants to play a part in MK Dons' run-in after missing so much of this season through injury. The 34-year-old has been limited to just four starts since signing from Exeter City in the summer, with injuries blighting his campaign at Stadium MK. However, his strike on 15 minutes gave Dons the lead against Yeovil on Saturday, and he nearly had a second but allowed Chuks Aneke to rattle home the decisive second late in the day. Having made just eight appearances all season, albeit with two goals, Harley was pleased to get back on the pitch again but said he wants to play more of a part as the season hots up. "I think it was my fourth start which is not enough," he said. "I've had a long term injury, I've played bits and bobs but it is what it is. I'm looking forward to playing in the next seven games. "The first goal is always important, and we've had a few games recently where we've gone gone a goal behind and things haven't gone for us. They had a few spells but it felt comfortable enough. "I've scored a few from that position in my time so I'm used to it, it was a decent strike and it got us off to a good start." Aneke's decisive second goal came from a brilliant solo run, but Harley could have prodded home from Aneke's toe, before stepping out of the striker's way to allow him to finish. Harley continued: "I was looking for the pull back and in the end, I just got out the way as best I could! "He has scored a few like that, he's such a good player and so strong. He changes the game when he comes on because he's completely different to anything else we've got." 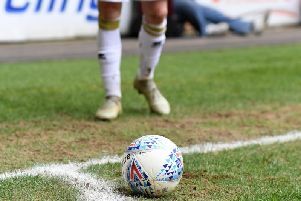 With Crewe pulling off a 2-1 win over Dons' promotion rivals Mansfield Town, it means Tisdale's side are three points clear in third spot and just two behind Bury in second. Harley though is not getting too carried away with what was a good day on the whole for Dons. He added: "You can't look at the run-ins, ultimately it doesn't matter. You can win or lose any game. We're where we want to be, but we have to kick on another 20 per cent or so."